The WAW2170.FC6261 TAG Heuer Monaco V4 Men’s Watch is a remarkable and unique timepiece. It is part of the second batch of the latest addition to the Steve McQueen’s noteworthy racing watches, and was recently debuted at the Basel Fair in Switzerland. 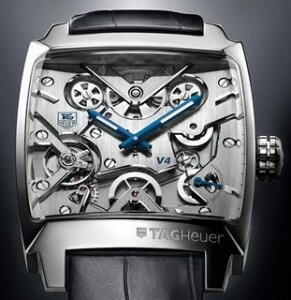 Such an extraordinary watch is sure to be snatched up quickly when it becomes available in June of 2010. The TAG Heuer Monaco V4 is an innovative mechanical marvel. It is the first watch to be driven by a belt transmission, rather than relying on traditional mechanical or quartz movements. It functions just like an automatic watch, featuring a tungstene ingot linear mass and two parallel barrel pair series linked by belts. This impressive technology is visible from the front, thanks to its skeleton design. The dial is held together by seven bridges done with “haute horlogerie” hand finishes. The inner workings are viewed through a pristine beveled sapphire crystal that has received anti-reflective treatment on both sides, thus insuring the mechanics are always visible. Other notable features of the Monaco V4 include a polished platinum 950 case and a polished white gold crown. It comes with an alligator leather strap that is secured by a polished platinum 950 folding buckle. It sports a blue “V4” engraving, as well as an engraved TAG Heuer logo in the lower right hand corner of the case. The watch is water resistant to 50 meters.